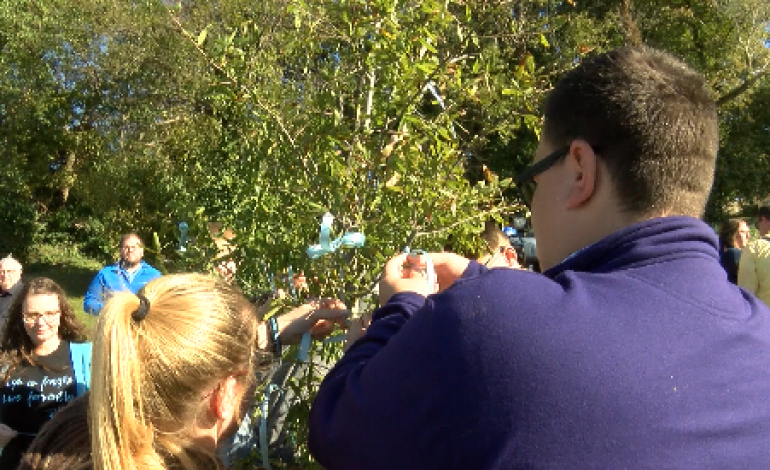 Right along River Walk in Henderson, a tree with blue ribbons tied on it can be spotted. It’s a dedication to 20-year-old Blake Crews who Kentucky State Police say was shot and killed in 2015. KSP says no one has been charged with his murder and the case remains an open investigation. Now nearly four years later, his family and friends are continuing to remember him. The ceremony was a chance for family and friends to remember Blake, but also to keep the case in the publics thoughts. “I just thought that if we put ribbons on the tree everybody would be able to look at the tree and see that the case is still not solved and no one has been held accountable for what they did and that we’re still seeking answers,” says Crews. Engraved on the plaque are the three values of Blake’s fraternity, Sigma Nu. “We want to pay tribute to him as a man of love, honor, and truth,” says Ron Sharp, Blake’s faculty advisor at Sigma Nu. Family and friends say the tree is a symbol for strength and endurance. They also want Blake’s legacy to endure too. “What we want to do is keep that story alive so that people will know there was a Blake Crews, that he lived, he was in our chapter, and that he mattered and we don’t want him to be forgotten,” says Sharp. And although officials are still investigating the case, family and friends say they just want closure. Friends and family say they hope to continue having dedications in the future and will possibly add a bench near the tree. Anyone with information regarding the case is asked to contact Kentucky State Police at (270)-826-3312.